At first, I was very skeptical about writing this article. I wanted to write about the Bolshoi pointe shoes after obtaining enough information about them to have something to offer my readers. After 2 months of very frustrating research, I’m right back to square one. I’ve decided to share my story and tell you everything I do know about them. The first time I ever heard about Bolshoi pointe shoes was when my friend, Monica Newell, mentioned having photographs of pre-glasnost era pointe shoes. Monica is the talented head designer of Costume Creations in London and is deeply entrenched in the ballet world. 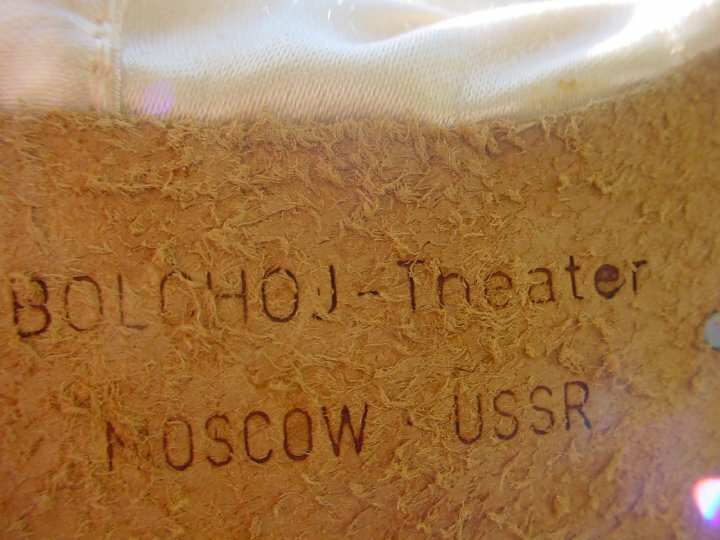 The Bolshoi Theater was in London in 1992. At that same time, Monica stopped by the Porselli Dance Shop near Covent Garden. There, inside a bargain bucket, were several pairs of Bolshoi pointe shoes. Loving the Bolshoi like she does, Monica instantly purchased the lot. Knowing that the Bolshoi dancers were in town, Monica had a notion to stop by the Gandolfi shop and inquire about the Bolshoi pointe shoes. Lo and behold, the clerk produced 2 bags full of discarded Bolshoi pointe shoes. Monica purchased the second lot and has had them ever since. Photographs of the Bolshoi pointe shoes were taken, and this is about as far as the story goes. I have spent numerous hours sending e-mails to various departments at the Bolshoi Theater with no response. I have tried contacting Bolshoi dancers through their Facebook pages, spoken with pointe shoe makers, and gone through listings of museums and dance historians only to come up empty- handed. I was fortunate enough to be given one pair for my collection. The Bolshoi pointe shoes are a true Russian pointe shoe. They are incredibly hard! They are pre-arched with a v-vamp, high sides and heels, and no drawstring. The soles on the Bolshoi pointe shoes are totally unique. The leather is brushed for traction. I have so many questions about these pointe shoes! Who made them? Why did the Bolshoi Theater stop making them? Did the dancers themselves complain about the shoes? Why is information about them so difficult to find? The Bolshoi pointe shoes were made and used before 1985 which can make getting information about them difficult, but not impossible. If any of you have any advice, leads, or information about the Bolshoi pointe shoes please feel free to contact me. Any comments are welcome. PHOTOGRAPHS COURTESY OF MONICA NEWELL/ COSTUME CREATIONS U.K. 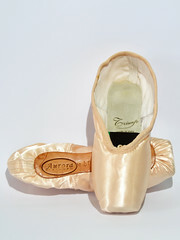 This entry was posted in Vintage Pointe Shoes and tagged antique pointe shoes, bolshoi ballet, Bolshoi pointe shoes, Pointe Shoe Brands, Pointe Shoe Images, pointe shoes made in Russia, traditional Russian pointe shoes, vintage pointe shoes. Bookmark the permalink. This article is beautifully worded – I hope too that perhaps someone from The Bolshoi Ballet Theatre can give us some more information. What a great blog. So specific and interesting. I love the photos with it. I found your blog while searching info on these shoes, as I have come across one pair in a Salvation Army. What have you found out about them? These still remain a mystery as far as who designed them. What we do know is that the Bolshoi Theatre does this at times. They make or commission special models for the dancers that are sometimes sold to the public from their Bolshoi Theatre Store. Although the vintage shoes shown here are almost 30 years old, we never know when information could suddenly surface. Hello,I recently bought two pairs of pointe shoes from a former small professional ballet company based in Bristol,UK called Pavlov Ballet.There is a BBC news item about them on Youtube. Pavlov Ballet was founded in 1998, and sadly by 2002,the company was dissolved.The company was run by 2 Russian sisters,Alla Chachina,and I don`t know her sister`s name. 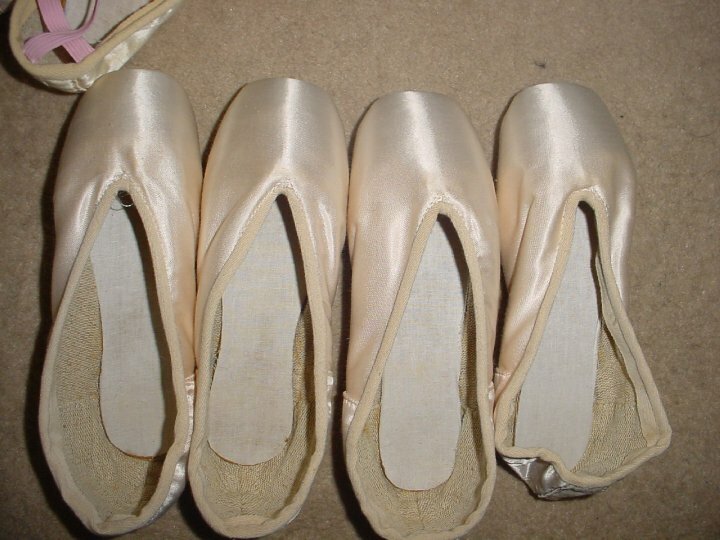 Alla told me the company[and its attached school] used to buy these pointe shoes in bulk to supply their dancers for free in the UK.The maker of my particular pointe shoes is Vinokur [they can`t remember his first name].He was one of many pointe shoe makers for the Bolshoi Ballet. Alla said after the collapse of the Soviet Union,Vinokur began taking small orders for his pointe shoes as an independent. I was told when Vinokur did work for Pavlov Ballet he was in his 60`s,so he may not still be alive today.She told me the Bolshoi Ballet have many makers of pointe shoes,as it is such a large company. I will try and send you the photos now.I have 2 pairs.The soles on each pair are slightly different. I do know about the Bolshoi pointe shoes. every theater had their own pointe shoe makers that would make shoes for the dancers in the company to their specifications. and then when the dancers were finished with their shoes or there was shoes they didn’t like, they would send those to the school and the students would wear the old shoes. this happened not only at the Bolshoi but at every theater in the Soviet Union. The reason why the theaters had shoes made by their own makers was a couple of reasons. A) traditional standpoint of their history of always having their own makers. and B) they did not have access to the brand name pointe shoes untill Grishko started his shoe company and they trend of custom theater shoes slowly went to the history books. 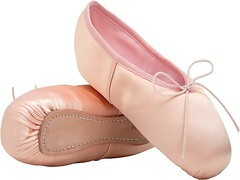 Now the leading pointe shoes for the Russian ballet companies at Grishko and Gaynor Minden. 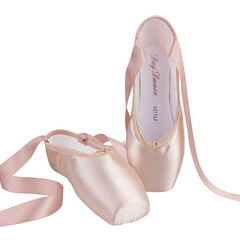 The closest pointe shoes that can be found that have the look and feel of a traditional theater shoe is Russian Pointe. as most of their styles offer very low V cut vamps, very hard shanks, no drawstring and other features. The reason why there is not much information about the shoes is because during the war and defection of dancers and townspeople, the government would strip them of anything they had, meaning shoes clothing photos and even training toilet pots for infants. and if a dancer defected from Russia or the Soviet Union, ALL video, photography and information about them would be erased as if they never even lived there. This is what happend with the theatre shoes. that is all the history i know. therefore its safe to say what happened in Russia stayed in Russia. The information that you provided here answers a lot of questions and makes perfect sense. I am fascinated with the fact that students were given old shoes back then. Times have really changed! Knowing all this makes me cherish the pair of Bolshoi pointe shoes that I have in my collection even more. 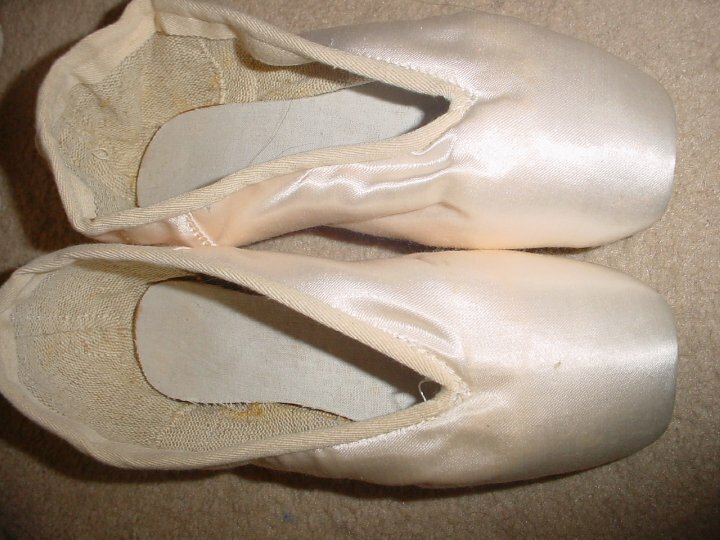 Hello, I have 2 pairs of Bolshoi pointe shoes.I bought them off Ebay in the UK.The woman selling them was the former owner of a company called the Pavlov Ballet in Bristol,England. [There is a TV clip of them on You Tube]. 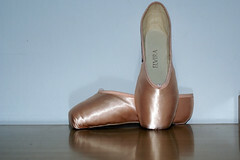 If you go to my pointe shoe blog, called pointeshoepassion.wordpress.com you will see photos of both pairs.They are both slightly different to each other. The woman I bought both pairs from told me all the company`s dancers were Russian. They used the same Russian pointe shoe maker they had used when still dancing in Russia. The pointe shoe maker in Moscow used to send over lots of pairs in bulk, both for the dancers of the company and the attached school. He was/is called Vinokur. She couldn`t remember his first name.She told me there were many different makers of pointe shoes at the Bolshoi. 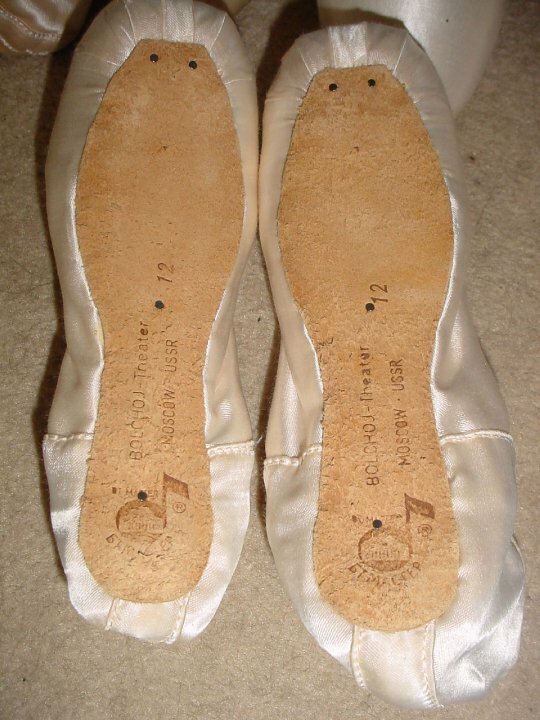 On one pair of my pointe shoes on both soles it says Master of The Bolshoi Theatre. What a joy to find this site. 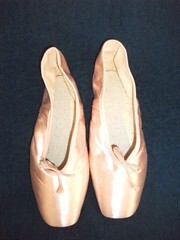 I have two pairs of the pointe shoes and one pair of ballet slippers. They came from a dancer in the Boshoi who was married to a lead tenor in the Bolshoi opera. He performed in several operas with the Orlando Opera Company and she accompanied him on one occasion. We entertained them in our home and she was gracious enough to give a master ballet class at my daughter’s ballet school. Because we are downsizing our possessions, I would love to sell them to someone who would appreciate them. 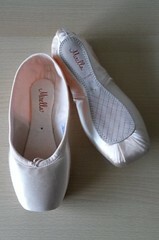 I recently purchased some old but unused pointe shoes from an online shop based in Croatia. They were described as from the 1980s and from Russia. If I send you some pictures of them, do you think you could identify the brand/maker? I’m thinking they are a pair of Bolshoi shoes, but I am not sure. They do have some markings on the sole. Please help if you can, as I would love to know more about these shoes! You can upload your photos here on this post by putting them on a free image hosting site like Image Shack and directly linking to them with html code. A Russian company called Russian Class made pointe shoes for either the Bolshoi and/or the Kirov. I actually have some of these old shoes. 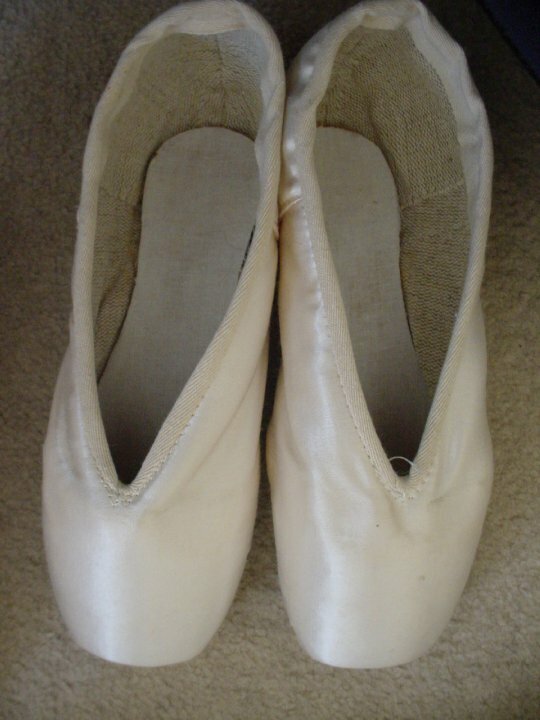 Hi, I used to dance in these pointe shoes in the early 90s (I was a kid back then). A local ballet/sports store in Zurich, Switzerland used to stock Bolshoi pointe shoes and flatties. I totally loved them because they were so different from my habitual Freeds, the Russian style V-cut vamp completely changes the line of your foot. I also recall them being quite heavy and sometimes the work was shoddy as in the nails would fall out of the soles and you’d gets bits of crumbled glue between your toes. The store eventually stopped stocking them and I was mighty excited when I discovered Grishko and their V-vamp but it was not the same thing. The pointe shoes that come closest to the Bolshoi ones are the R-Class/Russian pointe ones, but they’re much lighter which is a good thing. They have the crumbly glue bits though and they smell just like the Bolshoi ones used to! 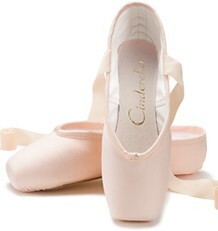 Freed and Russian Pointe are my favorite brands. 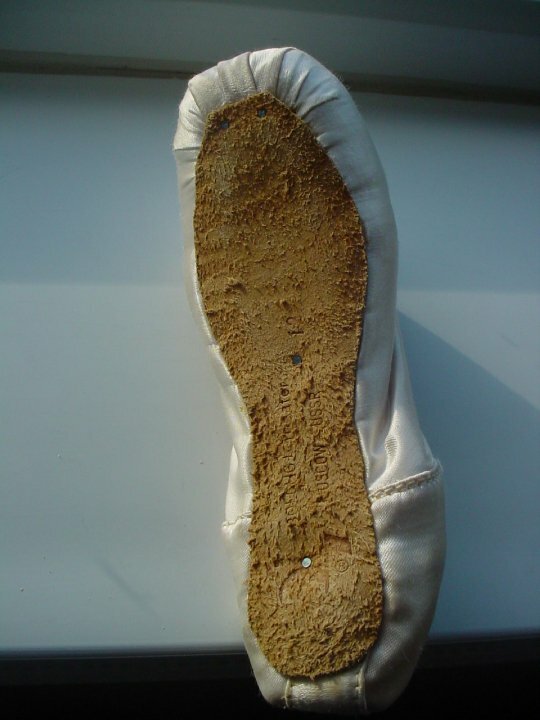 Crumbled glue between the toes is one pointe shoe complaint I have never heard before. Nails falling out is a nightmare to say the least. Thanks for sharing. I, too, have three pairs of Soviet Russian pointe shoes which somehow found their way to a shop in France. They look similar, but not identical to those on the pictures here and they seem to be a different branch because they are very soft and flexible, not much of a shoe, demi pointe nearly feels like in slippers – the real Marie Taglioni feeling so to speak. 🙂 And your feet look like in old pictures of Vaganova and Pavlova.